In one of his many articles, the late Ethiopia scholar, Prof. Donald Levine, ponders over Ethiopia’s failure to reverse a “pattern of missed opportunities”. He lists the 1960 coup attempt by the Neway brothers, the 1974 revolution, the fall of the Derg, the Ethio-Eritrean war, and the 2005 election as important historical junctures that could have changed the country for the better. Levine cites three reasons for the loss of the opportunities: (1) a culture of distrust, (2) “masculinity ethic and spirit of warriorhood”, and (3) unquestioning embrace of foreign ideologies that don’t fit the historic and contemporary realities of the country. No doubt Levine would have added the massive protests of the past twelve months to his list of “missed opportunities’. Also no doubt, alas, he would have been worrying that the three reasons that ruined previous chances could perhaps ruin the current one, too. Ever since the release of a document calling for an “Oromo leadership convention” by prominent Oromo political activists several weeks ago, there have been all sorts of passionate reactions across the Ethiopian political spectrum. The document instantly generated a firestorm of controversy because of its extremist interpretation of Oromo/Ethiopian history and its incendiary language. Probably its most controversial aspect is that it insinuates, in a not-so-subtle fashion, that the “Oromo nation” has been colonized by Ethiopia, and that it has to be liberated. The ensuing uproar forced some of the organizers of the convention to engage in a string of explanations on multiple Ethiopian media outlets. Even though the explanations were not particularly compelling, they were somehow able to convince many Ethiopianists to give the organizers the benefit of the doubt. Then came, weeks later, a conference of Oromo nationalists in London where speakers, including arguably the most prominent Oromo political activist, explicitly declared their intent to dismember Ethiopia in order to get what they want—with the sizable audience warmly applauding. That effectively put to rest any lingering doubts about the objective of the organizers. There is nothing new about the flimsy colonial narrative. It is a stale, overly simplistic, and reductionist myth that has been falling in and out of favor among Oromo extremists over the past five decades. Yet there are two things that are new and surprising about the narrative and the way it is being promoted this time around. Firstly, it is being promoted publicly, arrogantly, and at a time when multi-ethnic solidarity against the TPLF regime is gaining significant traction, at a time when the regime is visibly panicking over the solidarity. Secondly, the narrative has emerged as bare-knuckle, violent secessionism, without even its usual veneer of “a quest for self-determination”. What a strategic disaster it all turned out to be! 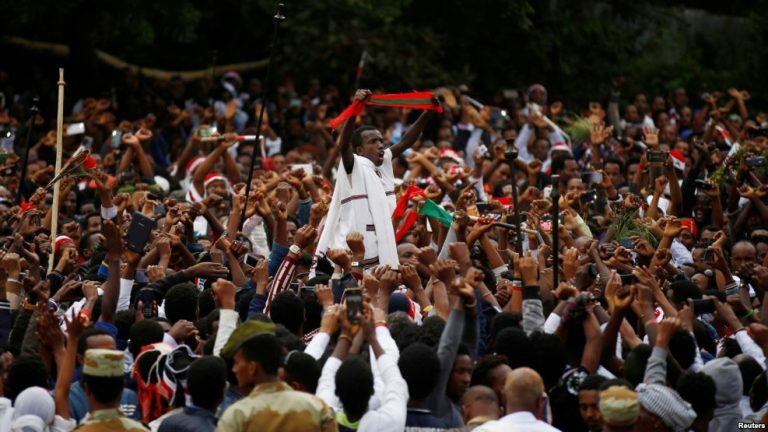 The Oromo nationalist community the organizers were supposed to galvanize behind the heroic sacrifices of Oromo protesters back home is now divided and engaged in open recriminations. Some of the Saner Oromo nationalist voices are seriously questioning and challenging both the content of the convention document and the verbal declaration of desire to break apart the Ethiopian state. Moreover, the TPLF propaganda machine has been having a field day playing the godsend fulminations from the London conference over and over and over, and many Ethiopians are taking the regime seriously for the first time in quite a long while. Above all, the Ethiopianist/unity camp that used to take Ethiopia’s territorial integrity and statehood for granted has been shaken to the core and deeply antagonized. So we could have a three-way battle on our hands all over again. Ironically enough, however, the hitherto (largely) dormant unity community has now a solid ground and a powerful rallying cry to mobilize around. Some may say that the separatist agenda is espoused only by a small group of individuals, and that we should not make a mountain out of a molehill, so to say. Well, this kind of optimism is problematic on many levels. For starters, even if we assume the group to be small, there is no denying that it is a very influential group, and really toxic one at that. The fact that some well-known pathological otherizers are among the people behind the convention also says a lot about what is going on. There are clear signs that what once was a fringe position is now enjoying a lot of mainstream attention. What’s more, judging from the relatively few unequivocal and principled denouncements among the wider Oromo nationalist community, there seems to be at least a significant level of tacit approval of the imperious declaration of intent to dismantle Ethiopia. None of this is to say that whoever threatens to dismember the country necessarily has the right or the power to do it, far from it. Part of the problem with the public silence of Ethiopianists toward ethno-nationalist fanaticism is that it gave the fanatics a false sense of entitlement and moral superiority. Truth be told, if history, justice, or fairness mean anything at all, most of the “arguments” of the colonial thesis wouldn’t get off the ground, to begin with. It has to be stated that, historically and morally speaking, no single ethnic group in Ethiopia, not even one, can claim an uncontested, exclusive right to all the geographical areas they currently inhabit. That is what makes the country a ship out in the ocean, as it were. All Ethiopians, especially those in the central and southern regions, are bound up together so tightly by an extremely complex web of factors. Any unilateral attempt to forcefully remove that web is like someone trying to bomb a ship they are aboard and to expect to survive the inevitable catastrophe. Either we all sail on the ship harmoniously—together, or we go down—together. This is a practical fact. The secessionists will surely take such inconvenient truths as empty threats. That comes as no surprise. After all, many of them have been living in an ethno-nationalist parallel universe where their “Oromia” exists in a historical, cultural, demographic, and geographic vacuum. Even worse, some of their collaborators are unabashedly claiming that there is no such thing as Ethiopian-ness. Although obviously nonsensical, such a claim could serve a broader and more sinister purpose than provoking or irritating Ethiopians. It fits nicely into an emerging pattern of extreme ethno-nationalist rhetoric that seeks to undermine Ethiopia as a historical entity and Ethiopian-ness as a legitimate identity. The pattern, however, is a sort of antithetical extension of the colonial thesis since it flies in the face of the myth that Ethiopia is a colonial empire. Coherent or not, nevertheless, the separatist network would do well to remember that their reckless activism is irresponsible brinkmanship at best and a declaration of war at worst. So it would be a mistake to play down, gloss over, or ignore the threats from the secessionists. Granted, the colonial narrative is essentially a delusional scheme that aims at political mobilization by whipping up collective self-pity. But that is what makes it especially dangerous: the scheme could succeed if enough people get deluded. And enough people can get deluded. Fortunately, the scheme has come out in the open, and has made it impossible for any one who cares about the country to sit idly by and watch political developments in the country like a neutral observer. That dubious luxury is no longer available. Still, when all is said and done, Donald Levine must be rolling in his grave. One can only hope that the hapless people of Ethiopia can avoid an endless internecine violence.